My apologies for not having a review posted last week. I came down with a nasty bout of strep throat which proceeded to decimate my immune system for the better part of five days. I’m better now (mostly) and I’m back with a couple of reviews. 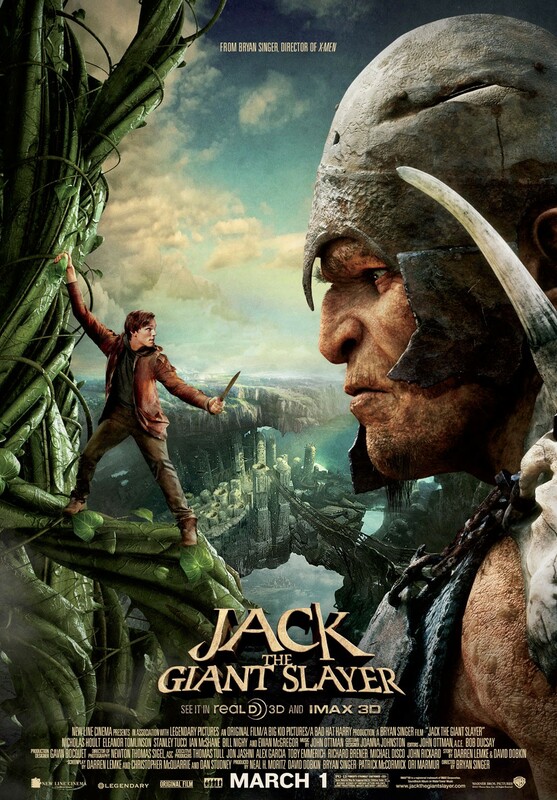 First up is a brief look at Jack the Giant Slayer. I want to describe Jack the Giant Slayer as being an extremely middle of the road, disposable waste, but even that feels a bit generous. The fact is there’s really nothing worth seeing in the entire film. The whole thing is just without any joy or creative spark and it seems to exist solely for the sake of a decent opening weekend after which it will fade instantly into obscurity. So basically it’s a January movie with a summer blockbuster budget. You know what, saying the story was just “okay” is also being a bit generous. The biggest issue here is that the story was crafted in a way in which nothing flows together. Every story beat stops dead in its tracks to make way for a new one. This is a story created entirely with “and thens” (any screenwriter worth his salt will tell you that connecting story beats with “and thens” instead of “therefores” or “buts” is one of the easiest ways to lose your audience). Jack goes into the village and then he meets the princess and then a monk gives him some magic beans and then it starts to rain and then the princess happens upon his house and then the beanstalk grows, etc., etc. In fact, the first 40 minutes of the movie is basically Disney’s Aladdin (just, you know, not as good). You’ve got a poor boy who dreams of adventure, a princess who constantly wanders away from the palace for adventures amongst the commoners. There’s a conniving royal advisor with an obnoxious sidekick who is seeking out a magical MacGuffin that only the poor boy can obtain. It stops being Aladdin after 40 minutes because of the aforementioned “and thens” but that first bit of the movie is beat for beat the 1992 animated classic, just lacking any of the wit or charm that made Aladdin work so well. I do have to take one comment back, though, there is one slightly bright spot in this whole dull mess of a movie, and that is Ewan McGregor’s performance. Playing a knight who is sent up the bean stalk to rescue the princess, he approaches the whole role with a slightly tongue-in-cheek Princess Bride quality. It’s as if he’s playing a part in a different film and I would have much rather seen the film he thought he was in. There’s a tricky tightrope that Disney and Director Sam Raimi had to walk in regards to this film. While L. Frank Baum’s fourteen original Oz novels are in the public domain, the 1939 film and much of the classic iconography it created still belongs to MGM. 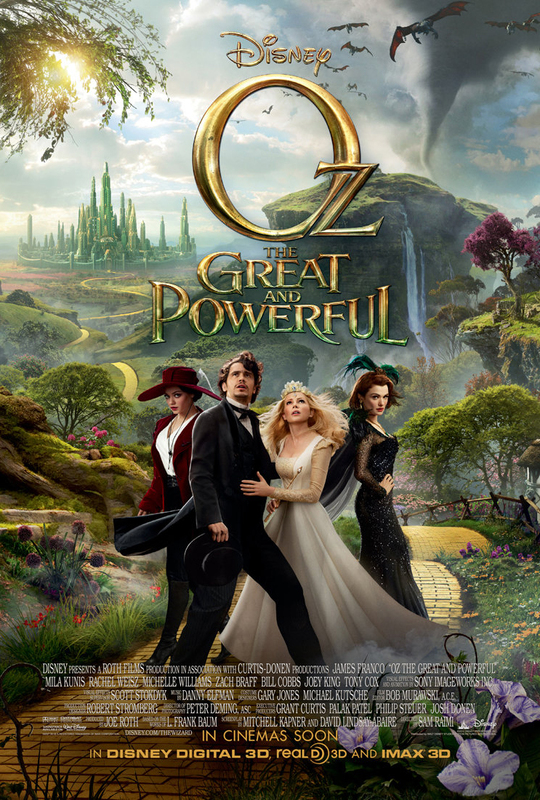 Oz The Great and Powerful attempts to be an unofficial prequel to MGM’s The Wizard of Oz. It tells the story of Oscar Zoroaster Phadrig Isaac Norman Henkel Emmanuel Ambroise Diggs, a magician who performs under the stage name “Oz” with a traveling circus. The film, mirroring the 1939 classic, opens in black-and-white Academy ratio and shows Oz as a selfish and opportunistic stage performer with little regard for anyone but himself. When one of his performances goes sour and a man who he has wronged begins chasing after him, Oz hops in a balloon to escape, inadvertently getting caught in a tornado where he is swept away to the land of Oz. Upon his arrival, he is taken for a prophesied wizard who is destined to save the land of Oz from a wicked witch who has killed their former king and is wreaking havoc on their people. Oz plays along when he learns that there is a fortune in gold and at least a few pretty girls waiting as reward for defeating the witch, and, as would be expected, he soon finds himself in over his head. What makes Oz work where so many other films being marketed to the same audience (Jack the Giant Slayer, Alice in Wonderland) have failed is that it doesn’t try to be something its not. It’s not trying to take a classic fairy tale story and make it “hip” or “edgy,” instead Sam Raimi gives the film a tone which is lovingly respectful of the original film and tries to be a worthy successor to that legacy. This is not a movie that shoehorns in unnecessary battle sequences or tries to go for an overly dark tone. Instead it aims for the fanciful storybook quality that the movie deserves. And it’s all done with Sam Raimi’s signature penchant for funhouse style antics. James Franco is perfectly cast as Oz, and is yet another in a long line of Sam Raimi “heroes” who thinks he’s much more capable than he really is. In a way, Oz The Great and Powerful is almost a family version of Army of Darkness. Both feature cocky, egotistical leads who find themselves in a strange land where they are mistaken for heroes of legend and must find a way to save the day despite their inadequacies. While Oz doesn’t face the same kind of abuse that Ash faced, he’s still played for the fool and ends up making things tragically worse for the people of Oz as a result of his actions. The real story at play in Oz is a story of human drama, of love and betrayal, and for the most part it plays really well. It allows us to connect with these characters and care about their situations in a way that you couldn’t care for, say, anyone in Alice in Wonderland. Mila Kunis, Rachel Weis, and Michelle Williams all turn in good performances as the three witches of Oz, Zach Braff is quite fun as Finley the Flying Monkey, but for my money, the real standout character is Joey King as the China Girl (a girl made out of porcelain). She steals just about every scene she’s in and is adorable without feeling saccharine. King’s performance is great and the effects work used to bring her to life are remarkable; one of the best CG characters I can recall in recent memory. Speaking of which, let’s talk about the CG work in this film. While there is a lot of CGI on display it never has the disconnect that the Star Wars prequels or even Alice in Wonderland had. Part of this is due to the regular use of practical sets (which is always a smart idea in CG-heavy productions), but it’s also worth mentioning that the way in which the CGI was used was very effective. In the 1939 film Oz had a deliberate air of unreality to it, with its over-saturated colors, its matte paintings, and its sets. In this film they use CGI to accomplish a very similar effect. It’s all done in a way that calls back to that tradition of old school effects work and ends up being very effective. The film doesn’t feel like the real world, but it feels real in the context of Oz, which is a whole lot better than being keenly aware you’re watching actors walk in front of a green screen as it was in the Star Wars prequels. There are a few areas where the film doesn’t quite live up to its potential. The middle of the movie drags a bit as it spends a lot of time setting up things that most adults in the audience will already be anticipating, and there were times when I wished Raimi’s funhouse scares could have gone a bit further (I did read that the film had to cut some of those moments out to achieve a PG rating, which I respect). However, I feel the biggest failing of this film is in the portrayal of the Wicked Witch of the West. As I mentioned before, this is an extremely tricky tightrope walk, and the very fact that the Witch is not being portrayed by Margaret Hamilton instantly makes it a pale comparison. Hamilton’s Wicked Witch is one of the most iconic characters in film history, and it’s sort of crazy to try to replicate that. What makes matters worse is the fact that a lot of the way the Witch was portrayed in the 1939 film belongs to MGM; Disney was scrutinized down to the shade of green they used in the makeup for copyright concerns. It feels like a case where they probably did the best they could given the legal roadblocks, but it’s still an element of the film that is potently disappointing and never quite works the way it should. Despite those complaints, Oz is a very fun film and possibly the most worthy successor to The Wizard of Oz that has existed in the nearly 75 years since. It hits most of the notes it needs to hit just right and actually leaves you wanting more, a rare accomplishment for a prequel. I also recommend seeing the film in 3D. This is Raimi’s first time working with the effect and now that I’ve seen it, it feels like a match made in heaven. He knows just when to go broad and gimmicky and when to pull it back and keep it more restrained. The opening credits sequence is gorgeous in 3D, and is worth the premium price for that alone. Oz The Great and Powerful may not be perfect, but it’s definitely worth your time.